Bangka is popular for tangy and spicy food using fresh seafood as it is a tropical island. It is also one of few regions in Indonesia dare enough to incorporating sweet ingredients in savoury dishes. Known as a melting pot for Malay and Chinese ethnicities in Sumatera, it results in rich culinary culture. Lempah Kuning is a very well-known dish of Bangka. It has distinctive taste consists of acidity of lime and tamarind juice, savouriness of seafood and bumbu putih (white spice mixture), and spiciness of chili. The sweetness of pineapple even add fresher element in the dish. Bumbu putih and bumbu merah used in Lempah Kuning are base mixtures used in many Indonesian dishes. Every Indonesian house has its own exact recipe but bumbu putih mainly consists of shallot, garlic, candlenut, coriander seeds, salt, and pepper while bumbu merah consists of bumbu putih ingredients mixed with ground chili. These mixtures can be made in high quantity and sautéed to extend its shell life to one month in the freezer. 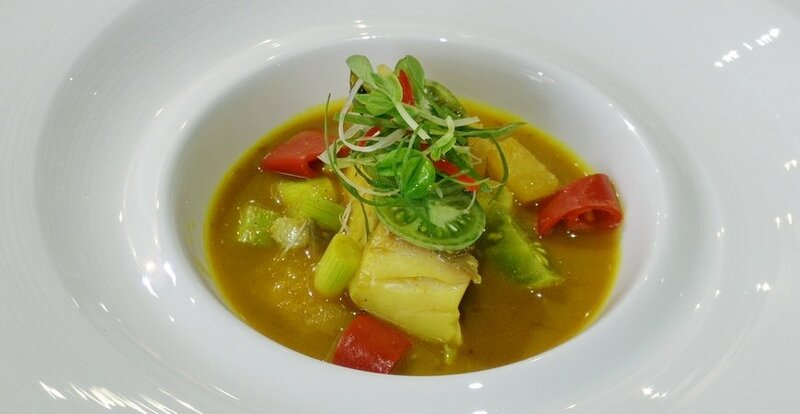 Chef Stefu Santoso, whose mother is from Bangka, has his own twist of Lempah Kuning. Instead of using grouper fish, he uses barramundi fish with its thick meaty texture and mild flavour. Not only using pineapple to add fruity sweetness in his Lempah Kuning, he also uses green tomato to give it more tangy kick. To give his Lempah Kuning thicker sauce, chef Stefu uses instant seasoned flour mainly used for frying chicken. Here is chef Stefu’s take on Bangkanese Lempah Kuning. 1. In a saucepan, sauté shallot together with red chili, kaffir lime leaves, galangal, and ginger until it develops its aroma. 2. Add bumbu putih, turmeric, and bumbu merah, stir. 3. Add the remaining ingredients except tamarind juice. 4. Simmer until it develops thick broth and pineapples are getting tender. 5. Add tamarind juice, stir. 6. Add barramundi and simmer until fish is cooked. 7. Garnish with julienned chili and spring onion.